Online Jewellery Shopping: Convenient, fast and affordable! ZeroKaata, your best online jewellery store brings to you 2500+ jaw-dropping designs of silver, semi-precious and artificial jewellery at a click of your button. Our USP lies in the creation of bespoke handmade designs which have been crafted with love, finesse and polished to perfection. Right from irresistible deals and discounts to a robust user interface, ZeroKaata provides amazing online shopping benefits. We at ZeroKaata, provide ease and lifestyle value at affordable cost, manufactured by Local Artisans across the country because of our state of the art website and guaranteed last mile services. All of this topped with our exclusive member-only benefits and free shipping makes your experience amazing and unforgettable. Enjoy a hassle-free online jewellery shopping experience only at ZeroKaata, the best online jewellery store. With 24/7 availability, our customer service team is always on hand to assist with the customer’s queries. We make sure that all our customers enjoy the best shopping experience. Don't believe us? Visit www.zerokaata.com now and experience it yourself. You can reach out to us at info@zerokaata.com or call us at +91-8920578655. We at ZeroKaata, provide a user-friendly interface which is secured with trusted badges like MacFee, GoDaddy, SSL Trust and many more. We at ZeroKaata, make sure that each of our jewellery pieces is made with lead and nickel free metal, thereby providing 100% skin-friendly jewellery. In case you have any issue with your already purchase jewellery, please reach out to us at info@zerokaata.com or call us at +91-8920578655. ZeroKaata, the best online jewellery store has 2500+ bespoke handmade jewellery designs which are provided at cutting-edge prices. ZeroKaata provides remarkable designs from unique and spectacular handmade jewellery collections that include Designer, Western, Chandbali, 9-5 Workwear, Wedding, Statement, Wooden, Seed Beads, Tribal and Silver Jewellery categories. ZeroKaata’s western jewellery collection features everything from quirky yet elegant western earrings to eye-catching layered necklaces that are not only easy to wear and classy to style but also take care of your pocket. Shop from the best collection of western baubles only at ZeroKaata, the best online jewellery store. Sign up with us to get flat 15% off on your first order. ZeroKaata, the best online jewellery store brings to you an exclusive range of offers that you cannot resist. 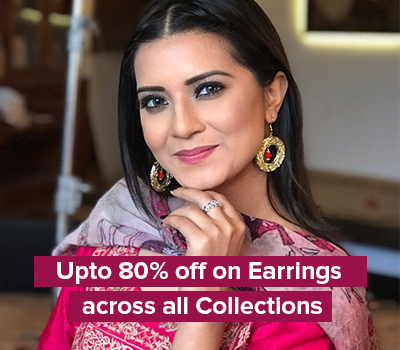 Shop from our exclusive range of offers: Buy any 4 Earrings for just Rs 399, Buy any 4 Chandbali Earrings at Rs 599, Buy any 1 Bead Jewelry for Rs 199, Buy any 1 pair of Wooden Earrings for Rs 199, and affordable combos of handmade jewellery. Featuring a flattering range of designs, styles, patterns, and color combinations, our offers collection of fashion Jewellery contains extremely lightweight baubles which are not only easy to wear but are also fit for your both causal and work look. You can wear these baubles all day long without getting uncomfortable. Care Instructions: Store individually in a Zip-lock pouch and keep away from moisture, perfume, and water (specifically) in order to maintain its original look. ZeroKaata’s statement jewelry collection features everything from larger than life statement necklaces to exquisitely crafted ceramic necklaces. ZeroKaata’s entire range of statement jewellery features handmade pieces which have been crafted with skilled craftsmanship and utmost precision. Invest in our Statement necklaces and leave everyone captivated by your stunning look. ZeroKaata’s silver jewellery collection features everything from delicately crafted sterling silver jewels to brass jhumkis with silver plating. Shop from a wide range of antique silver jewellery collection of earrings, necklaces and rings and look stunning. Shop your desired silver jewellery at ZeroKaata, the best online jewellery store and get an additional 15% off on your first order. Sign up with us to avail the offer. ZeroKaata provides a ready to gift package. We also provide a personalized handwritten note. We provide a quick delivery service so that you don’t have to wait to wear your ZeroKaata Skin friendly jewellery. You can sign up with us to get 15% off on your first order. At ZeroKaata, we provide you with an easy access to the trendiest celeb-inspired looks of the season. Complete your celeb-inspired lookbook with our classy and trendy handmade jewellery designs. Get inspired from our celeb-endorsement section featuring celebrities like Sonam Kappor, Hina Khan, Mouni Roy, Rakul Preet and famous fashion bloggers like Shivangi Singh, Ashna Shroff, Mahhima Kottary etc and adorn a celeb-inspired look. Shop from our wide range of celebrity inspired jewellery and sign up with us to get 15% off on your first order. Featuring Chandbali and Wedding jewellery collection, our traditional jewels are inspired by Indian heritage and culture. Shop from the latest collections of skin-friendly traditional jewellery designs which include everything from earrings to necklaces, jewellery sets, and maang tika jewellery sets and slay like a sassy diva. Shop now and get 15% off on your first order. Featuring everything from jewels encrusted with semi-precious stone like Amethyst, Aventurine, Druzy, Howlite, Labradorite, Lapis Lazuli and much more, our designer collection of semi-precious jewellery has been crafted with detailed intricate work, and skilled craftsmanship. Shop from a wide range of our designer collection of semi-precious handmade necklaces, chokers, earrings and rings and sign up with us to get 15% off on your first order. Featuring everything from classic hoop earrings, cuffs and bracelets, our 9-5 officewear jewellery collection takes care of your work style. Invest in our comfortable to wear baubles from 9-5 officewear jewellery collection and let us take care of your work style while you go rule the world. ZeroKaata, the best online jewellery store provides an exquisite collection of traditional yet modern oxidized silver jhumkas, chunky silver rings, chunky silver bracelet, oxidized silver necklaces, and meenakari earrings. Featuring intricate designs and skilled craftsmanship, each piece from our Indian tribal jewellery collection has been crafted with love and finesse. Shop oxidized jewellery online and add dollops of eclectic tribal charm to your look. ZeroKaata’s beads jewellery collection is the perfect mix of elegance and style and features colorful and attractive beaded earrings, chokers and bracelets which have been handmade with utmost delicacy. Shop from ZeroKaata’s beaded jewellery collection and get 15% off on your first order. Sign up with us to avail the offer. Get easy access to the all the trending celeb-inspired looks of the season and shop from our jewellery collections with products that you just cannot turn down. Check out our “CELEB-ENDORSEMENTS” and “SHOP THE LOOK” section. It features famous B-town celebrities like Rakul Preet, Sonam Kapoor, Hina Khan, Mouni Roy and famous fashion bloggers like Aakanksha Sareen, Shivangi Singh, Ashna Shroff, Mahhima Kottary, Aveera Singh, and adorn a celeb-inspired look. Become the gifting expert by following these simple rules. Rule 2: Not sure of her ring/arm size? Don’t worry, choose from our wide range of Earrings and necklaces without worrying about her wrist or arm size. Rule 3: Still confused about what to gift her? Well! Buy ZeroKaata Gift Cards for her and make her happy. We have a plethora of gift card options starting from 100 INR going all the way to 20,000 INR. ZeroKaata Studio, India’s best jewellery blog features anything and everything about jewellery. We aim to curate best of the content for everyone and anyone who has an affinity to jewellery and loves to catch up with fashion trends, thereby featuring everything from “Jewellery of India”, “The Great Indian Jewellery Tour”, “Jewellery Hacks”, “Jewelery Trends”, “Gifting Guide”, “Jewelry Design Courses”, “Jewelry News”, “Shows & Events” to “Celebrity inspirations” and so much more. Explore the first-of-its-kind content curated by jewellery connoisseurs to unravel the glamorous world of fashion and jewelry and get an instant update on the latest trends, red carpet events at the comfort of your home. Shop from 2500+ bespoke handmade designs at ZeroKaata, the best online jewellery store and experience a hassle-free world of online jewellery shopping.